Whale's mouth: this effect is the weird-looking sky sometimes appearing when the first gust front of a storm is passing over. 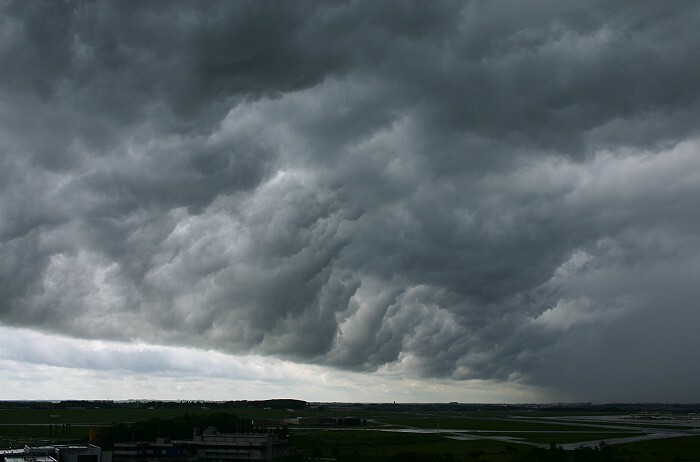 The cold downdraft of air of the storm rushes outward and forward along the surface, and lifts the warmer air in the direct vicinity of the storm over its condensation level. One gets to see the back side of this mini cold front, and the inside of the gust front cloud. It looks somewhat like mammatus and other forms of turbulent cloud masses, sometimes showing very neat ordering. In my area this effect usually occurs a couple of times a year.